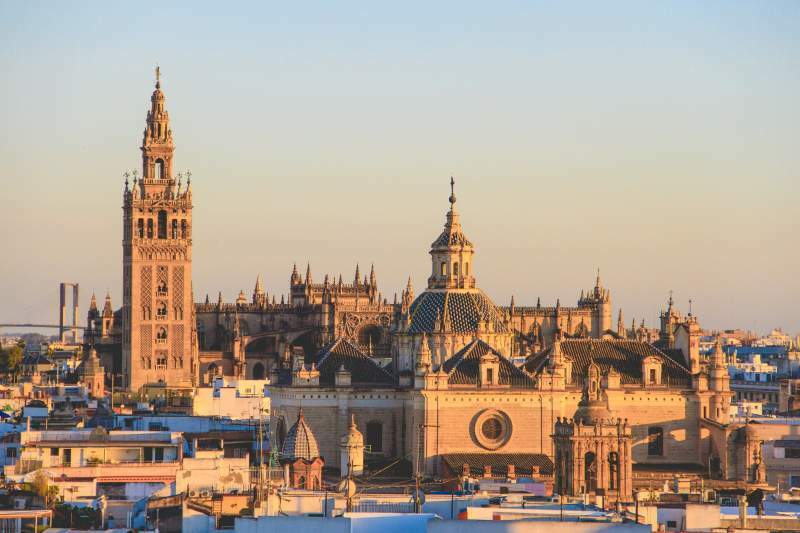 By the time you've made it past the first stage of learning Spanish, you're probably feeling pretty confident. Although you have a pretty good command of the language, Spanish can still throw you a curve ball every now and then. 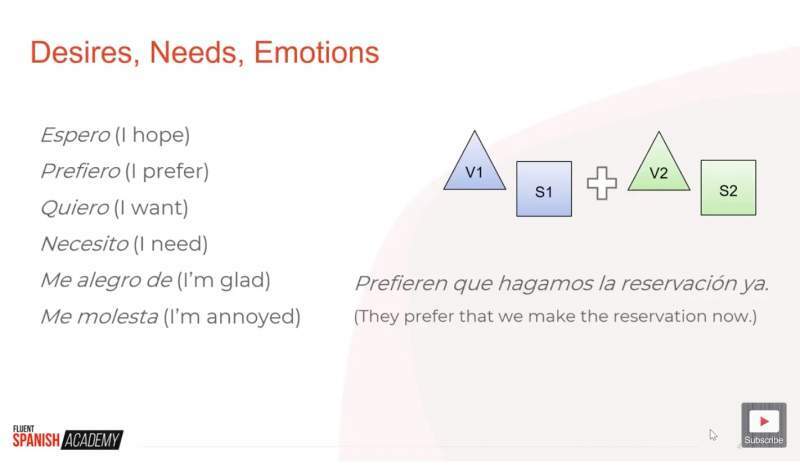 The Spanish subjunctive mood is one of those curveballs because it's not something we use in English so much, apart from a few remnants like “I wish you were here” or “God save the Queen”. In short, you absolutely need the subjunctive mood to speak Spanish like a native. I've gone over when to use the subjunctive in a video here. Or you can scroll down and read everything you need to know below. Once you understand the subjunctive, you'll probably realise there are things you've been saying wrong this whole time. For example, can you tell if this sentence is correct? By the end of the article, you'll know if this sentence is correct and why (or why not). Before tackling the question of when to use the subjunctive, you'll need to know how to conjugate it. So let's get started. Conjugating the subjunctive is actually pretty easy. Even verbs that are irregular in the indicative are simple to conjugate into the subjunctive because all you need to know is the yo form. And that's it! Once you learn those six irregulars, you'll have everything you need to know to form the subjunctive pretty quickly. What takes some practice and can be confusing is when to use the subjunctive and why. 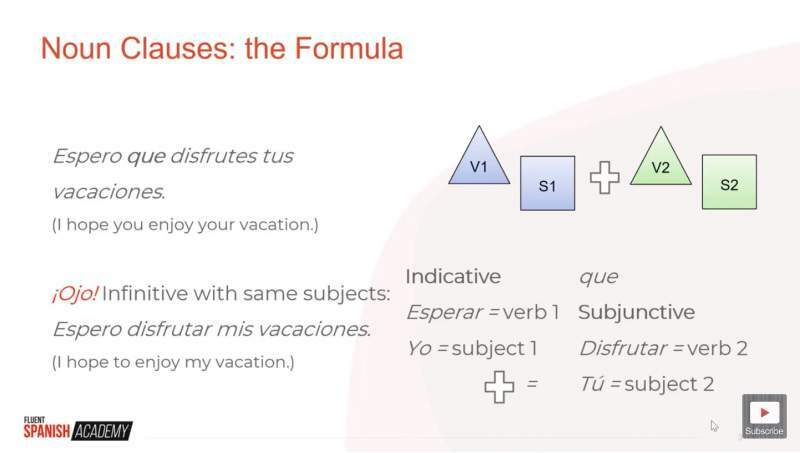 I use a noun clause formula to know when the subjunctive is needed in Spanish. The most basic components you need to make a sentence are a subject (the noun) and a predicate (the verb). In Spanish, those two parts are often combined. Hablo, for example, is both the subject (I) and the verb (speak). With noun phrase subjunctives, you have two subjects and two verbs separated by que. When these conditions are met, the second verb is conjugated in the subjunctive. ¡Ojo! : This only works when the two subjects are different. To say, “I hope to enjoy my vacation” (both subjects are yo), you would simply say, Espero que disfrutar mis vacaciones. What About The Third Point? An uncertain or emotional mood. The subjunctive is also called “the subjunctive mood” because it accompanies sentences and phrases that convey a certain feeling. So does our example sentence count? Yes! Espero que disfrutes tus vacaciones conveys a desire with the verb esperar. ¡Ojo! 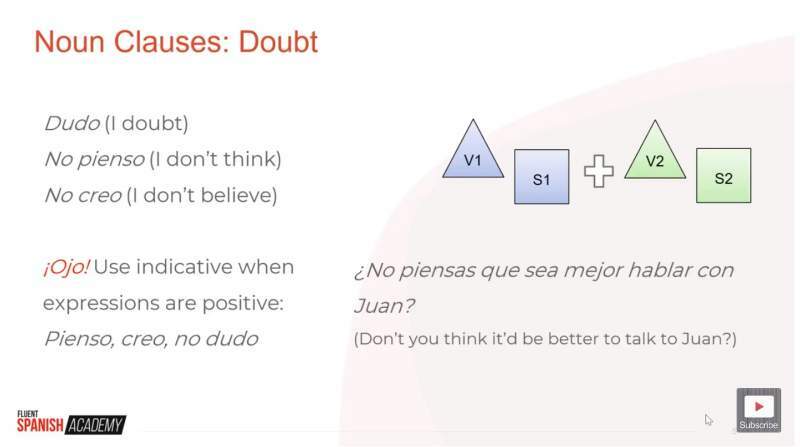 : Verbs like pensar and crear only signal the subjunctive when they are negative (expressing doubt). In their positive forms, use the indicative. The same is true of “no dudar” (to not doubt). These are not simple statements of fact. Although they are impersonal statements, they're still expressing an opinion or possibility. It's not a straightforward statement. Often, when you have a point of view or subjective statement, it's a clue you need the subjunctive. Again, que is dividing two parts of the sentence—two subjects and two verbs. 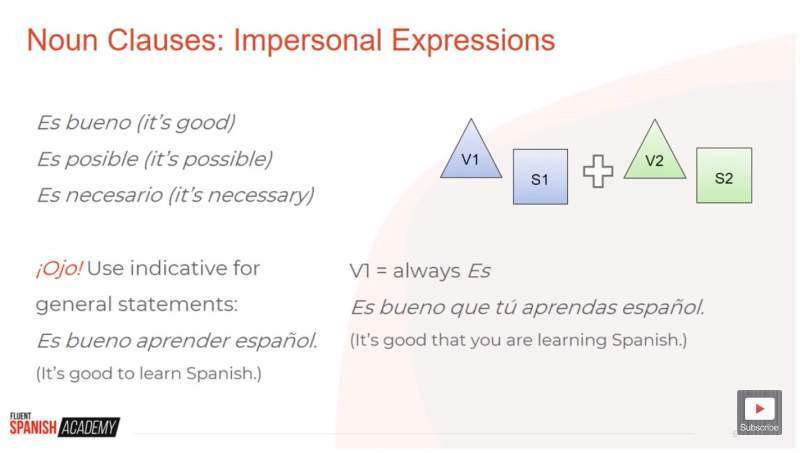 With these impersonal expressions, the first subject and verb are contained in es (it is). There's an impersonal expression (es posible) that expresses a possibility or uncertainty and two subjects/verbs separated by que. 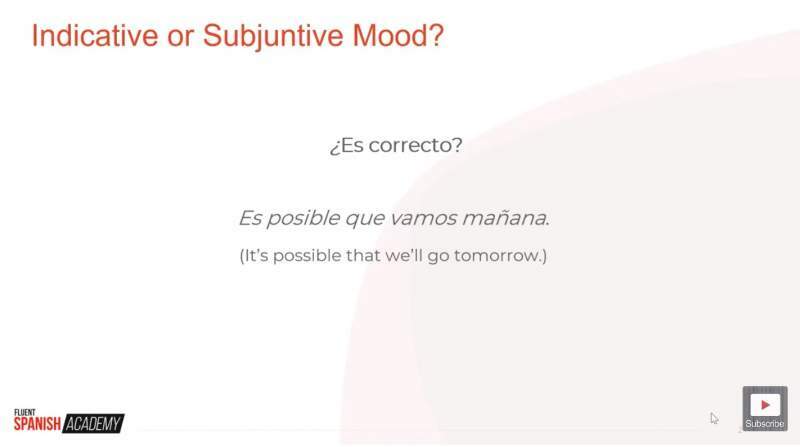 All three sure signs that you need the subjunctive mood! So, you need to say, Es posible que vayamos mañana. 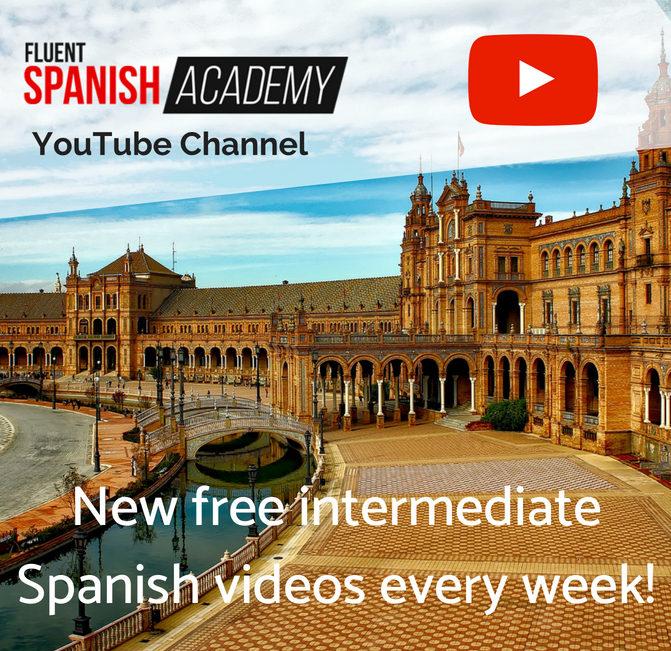 Although you've now seen many of the most common uses of the Spanish subjunctive, you've only just scratched the surface. There are exceptions and other situations you will need eventually. 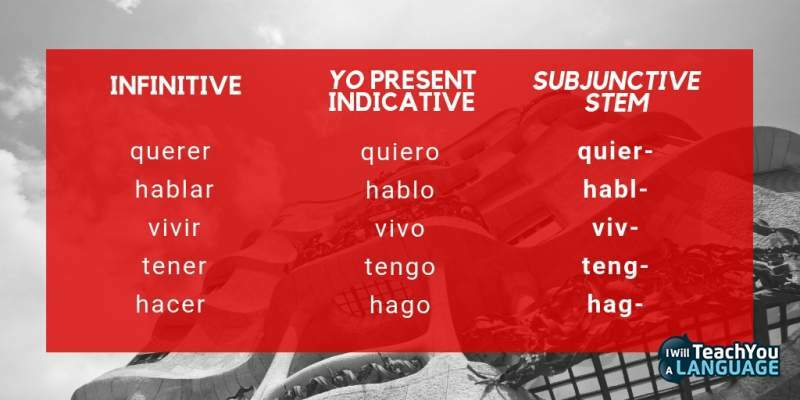 Now that you have a basic understanding of the subjunctive, it's time to go out and listen to and read lots of authentic Spanish. As you do, you'll probably be surprised at how common the subjunctive really is. That is one reason I recommend you use stories to learn the subjunctive. You can find a whole collection of short stories full of the subjunctive that can help you learn the subjunctive naturally and quickly here. 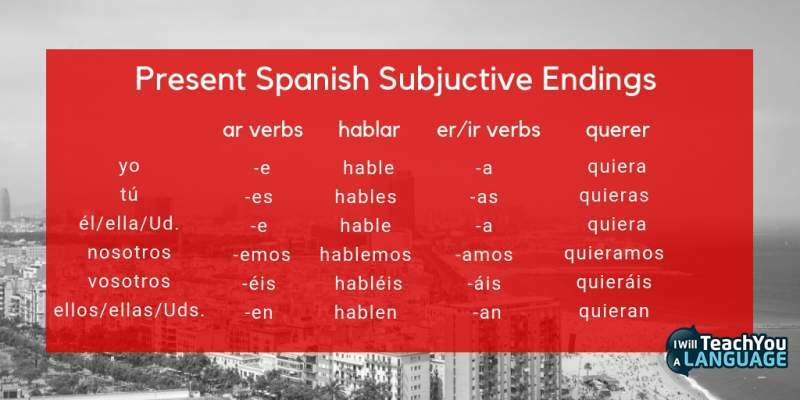 It's easy to get confused with the Spanish subjunctive when you're just getting started. But once you know what you're looking for, you'll start to notice phrases that fit the noun clause formula all throughout your day-to-day conversations. The Spanish subjunctive doesn't have to be difficult. You can do it! 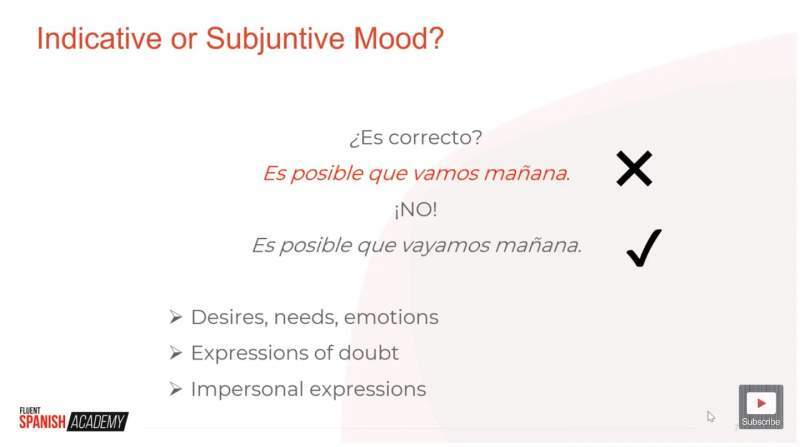 So, after reading all that, do you feel more confident about using and understanding the Spanish subjunctive mood? And are there any other areas of grammar you find tricky. I'd love to hear your thoughts in the comments below. Thanks!